As the current Winter Season draws to a close on the 26th October it seems only fitting to clarify the changes being made for the Finals. We enter the Finals on the back of what can be perceived to be our most successful Season yet in terms of player participation. It's clear that we're moving in the right direction,. We aren't yet able to announce the date the Finals will commence. We know only too well the benefit of having access to early information, so rest assured that we'll provide the specific date as soon as possible. We can tell you that we're aiming for early December. There is no cap on XP gain. Unskulled players protect all XP lost on death. There is a 50x rebuild rate on XP in stats previously lost on death. Dying with, or dropping, a stack of Chinchompas will cause it to appear on the ground, visible to all players. All rune and arrow shops now restock at a much faster rate. Fletching & crafting supply stores will also restock at a faster rate. Lower tier equipment will restock faster than higher tier equipment, for example: an air rune will restock faster than a death rune. Changes remain in place to prevent door spamming. We received reports that specific areas were still troubled by issues of door spamming. Please reply to the forum thread linked at the bottom of this post to report the issue. There is a skull penalty for all players attacking a skulled player. The skull penalty will last for 5 minutes. If you previously had a skull with less than 5 minutes remaining it will revert to 5 minutes. If you previously had a skull with longer than 5 minutes remaining it will remain unchanged. There is a 1 minute grace period for reasonable kills. This grace period will be a temporary status of immunity from the attacks of other players. A reasonable kill can be defined as killing a player within 30 combat levels of yourself. If killing a combat level higher than yourself you will always receive this grace period of immunity (e.g. a level 90 killing a level 126 will receive the grace period). If you die or attack another player within this minute then you will lose the remaining grace period. The grace period will be lost upon logging out. The change to losing items remains in place. You will only lose 80% of an item's stack. This applies only to stacks of 5 or more. For example: if you had 4 Abyssal whips, you'd lose them all. If you had 5 Abyssal whips, you'd lose only 4 of them. The Protect from Magic protection prayer does not halve the duration of the Bind, Snare, and Entangle spells. POH pools are unavailable for 3 minutes after combat. Barrows is accessible for the entire week of the tournament. Raids, Zulrah, and Lava dragons are inaccessible for the entire week of the Finals. In addition to the normal loot offered by killing them, Callisto, Venenatis, Vet'ion and the Chaos Elemental also have a 1 in 3 chance of dropping a single 4-dose Saradomin brew. In addition to the normal loot offered by killing them, Scorpia, Crazy Archaeologist and the Chaos Fanatic also have a 1 in 5 chance of dropping a single 4-dose Saradomin brew. A very in-depth retrospective followed the last tournament and the lessons learned have shaped this Season's Finals. We're confident that we're able to resolve any logistical problems, as well as issues with in-game mechanics which have affected previous tournaments. Our intention with the Winter Finals is to enable the progression of solo players and small groups, but not at the expense of totally nerfing the effectiveness of larger, organized clans. The first significant change arrives in the form of supply chests. The chests will appear each time the fog advances. We will announce the location of these chests in two different stages: the first notification of the location will remain vague (e.g. Falador), whilst the second notification will be specific (e.g. Falador Party Room). The chests themselves will offer very lucrative rewards, such as sought-after weapons with special attacks, lamps which will increase combat skills, and Overload potions. We intend for these chests to encourage fights throughout the entire duration of the Permadeath stage, and also to offer a huge power increase for those courageous enough to attempt to loot them. The next change comes with the addition of a second 'final area'. Previously we had one set location announced beforehand to all players. This would pack everybody into a small area which would reduce the spectacle of the event, with it being nothing other than a cluster of multi-spells and Chinchompas. Our proposed change introduced a second area. We will evenly split players between the two final areas: Barbarian Village and the Demonic Ruins in the Wilderness. Players will be assigned a final area location randomly once the Permadeath stage begins, with the fog being specific to each player. The aim of this is to split up large groups of players and to promote a more varied viewing experience with two groups of players having to adapt to different tactics depending on their designated final area. The last surviving 64 players in each final area (128 players in total) will be transported to the final islands, which are detailed below. The most notable change is the expansion of the final islands concept. In the last tournament we introduced four islands which the survivors of the final hour were funneled into. The final four remaining individuals were then transported to a single central island. We're reworking the final islands to transform them into a structured knockout-style tournament. The remaining 128 survivors will be teleported to 64 individual islands. Players will be teleported to a random island regardless of level, location, gear etc. for a set of 7 brackets of 1v1 fights. 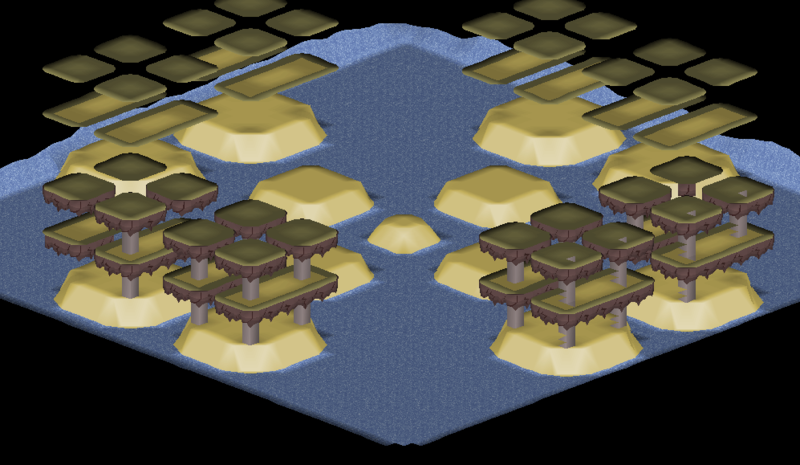 For the first set of islands, players will be teleported with the gear, stats and inventory that they left the mainland with. Items that are manually dropped by players cannot be picked up or traded whilst they are on these islands. Healing supplies will not be dropped on death. A slow ticking fog will begin to chip away at players health in order to prevent intentional stalling. Once only one player remains on an island they will automatically be teleported onto the next bracket. You will have a short period of time in which to loot from your opponent. Players who are successful at progressing beyond the first bracket will have their inventory wiped of supplies (food and potions) and we will be providing a set number of food and potions potions to even the competition outside of gear upgrades that they have obtained along the way. We will announce the amount of supplies prior to the launch of the Winter Finals. We aim to be holding an open public beta of the Deadman Mode Permadeath stage in late November. This will make sure that all of our systems are fully functional ready for the actual final in early December. We will also be inviting our casters in for a live rehearsal to ensure that all parties are fully aware of the format and content changes prior to the final broadcast. When we reach the final islands we will have 4 casters in total in order to ensure ample attention is paid to the number of fights going on. As you may have noticed from the above, we're doing away with the concept of the Final Hour. Instead we refer to it as the Permadeath stage. Adding an arbitrary time allowance affects the quality of the final. We will be supported in real time by our anti-cheating specialists to help moderate the events of the Finals, specifically those found to be boxing, as well as running real time account checks for the final participants. This Invitational represents a restructuring of our prize offerings. The remaining 12 players who comprise the final 16 will receive the prize of 12 Months Membership. This website and its contents are copyright © 1999 - 2019 Jagex Ltd, 220 Science Park, Cambridge, CB4 0WA, United Kingdom.